The beginning of the day will be dedicated to a tour of Dresden on foot. As we cross the city, we'll discover the historical monuments that have contributed to its glory. In the afternoon, enjoy a visit of the Semperoper Opera House(1). This morning, we'll leave on a guided tour of Meissen, famous for its trademark porcelain. Enjoy some free time at the winter market(2). We'll spend the afternoon cruising to Lutherstadt Wittenberg. We'll leave on a guided tour of Lutherstadt Wittenberg, eponymous birthplace of Martin Luther. We'll return to the ship and spend the afternoon cruising to Magdeburg. Tonight is our gala dinner and evening. Join us on a guided tour of Magdeburg - situated midway on the Elbe River and also on the historic Roman Roads. Join us on a guided tour of Charlottenburg Palace. In the afternoon, join us for a panoramic tour of Berlin with an overview of the main monuments. Tonight, revel in our festive New Year's Eve dinner and evening. 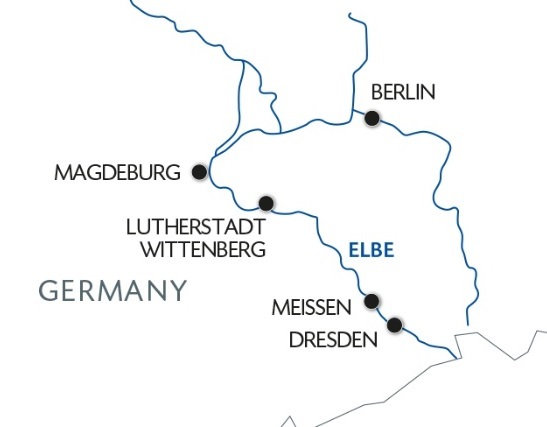 Join us for a festive cruise along the Elbe River this New Year! Discover artistic and cultural jewels in Dresden as well as the picturesque towns of Wittenberg and Meissen. Take part in our panoramic tour of Berlin and discover the mythical German capital.